There was a video posted recently about Vault Office, so I thought I would have an article about API licensing for Vault Office. And while I’m at it, I may as well go over all the licensing rules for Vault 2015. It’s not my favorite topic either, but it has to be done. I’ll try to go quickly. In case you are not aware, Vault Office is a separate license type designed for non-CAD users. The idea is simple: The Office license is cheaper than a standard Vault license, but the functionality is limited. There are specialized clients which consume Vault Office licenses instead of regular Vault Workgroup or Professional licenses. Don’t confuse Vault Office with the Vault plug-in for Microsoft Office. They are different things. Actually, there is an MS Office plug-in which consumes a normal Vault license and an MS Office plug-in which consumes a Vault Office license. So I guess it is kind of confusing. Regarding API development, you cannot develop your own apps against a Vault Office license. Currently, none of the Vault Office clients support plug-ins. If you write your own standalone client, it will log in using a standard Vault license. Vault Workgroup and Professional Development allowed. Vault Server manages the license. Development allowed. No license is consumed. Development not allowed. Update: One of my readers was able to find a link to Visual Studio 2008 Express Web Edition. After that, install the Reporting add-on, and you should be good for RDLC editing. Thanks Alex. Oh, it’s not up there anymore. Well, lets go over our options then. Before my record gets scratched up too much, I’m going to rule out time travel and breaking into ancient history museums. Here are some helpful ways to edit your RDLC file. This is a free editor from a set of RDL / RDLC tools from fyiReporting. It’s almost as good as Visual Studio 2008 was. Unlike VS 2008, the RDL Designer is still available for download, which makes it the best RDLC editor by default. I’ve used this tool myself, and I like it a lot. My only complaint is that there is no snap feature or ability to easily line up your UI controls. So you end up with a bunch of text boxes that are off by a few pixels. If you are obsessive compulsive, this will drive you nuts. You can line things up by modifying directly editing the properties, which is also extra painful. Because RDLC is built around printing, all the dimensions are in units like inch, centimeter and point. You can't define things in pixels, like I am used to in UI design. Aside from the alignment issues, everything else is done well. For example, you can easily create tables by selecting the fields you want, and it will build the data for you. RDLC files are just XML files. So you can use any text or XML editor to make changes. It’s obviously harder to do it this way because you are designing a UI in a non-UI environment. But it’s a good option for people who like to challenge themselves for no reason at all. I should also note that the fyi RDL Designer has an XML mode. So you can easily switch between the UI view and the XML view. Very useful. If you happen to run into any of those fyi guys, tell them I said thanks. One very big feature in Vault 2015 is the ability to turn a BOM row “on” or “off”. I’m going to quickly go over the workflow for disabling a BOM row through the API and how to view that disabled row. The on/off status of a BOM row is handled by the “isIncluded” property on a BOM association. So disabling a BOM row is just a matter of setting isIncluded to false. Call EditItems on the parent Item in the association. Call GetItemBOMByItemIdAndDate to read the BOM. Make sure to use the item ID from the editable item returned in part 1. 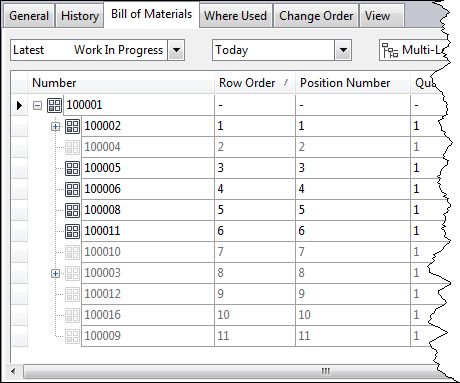 In the resulting ItemBOM object, locate the ItemAssoc object representing the row you want to disable. Call UpdateItemBOMAssociations to update the isIncluded value. Although the function takes arrays of data, you only need to pass in the associations you are updating. Call UpdateAndCommitItems, passing in the parent item only. This will finalize the change. By default, the GetItemBOMByItemIdAndDate will omit all of the OFF rows. If you want to see the row you disabled, you need to include “ReturnExcluded” in the options parameter. This parameter lets you OR together multiple options, like a bitfield. So passing in both “Defaults” and “ReturnExcluded” with show all the ON and OFF item rows. In Vault 2015, PromoteFiles has been removed from the ItemService. Previously, the quickest way was to call PromoteFiles followed by UpdateAndCommitItems. Of course, more complex cases would require more API calls and data checks. Anyway, the simple workflow just got more complex in 2015. That’s sometimes the price you pay for better functionality. Before I dive into the new code, let me explain the reason for the change. First, PromoteFiles was not very efficient. It tried to do the entire BOM at once, which is bad for server performance and scalability. Next, it favored a file-first workflow (the files need to get created before the items). In Vault 2015, there is much better support for item-first workflows, which I’ll go over in other articles. For now, let’s go back to the simple file-first case. You have an Inventor assembly checked-in and you want to create the BOM in Vault. Basically, PromoteFiles has been replaced by 4 function calls: AddFilesToPromote, GetPromoteComponentOrder, PromoteComponents, and GetPromoteComponentsResults. The "timestamp" variable is the thread that ties together the four calls. When you want to finalize the operation, call UpdateAndCommitItems just like before. Yes, it seems like 4 function calls makes things worse than before. It's definitely more work for a client, but it makes and improvement on the server side. Less is done in a single call, which means that transactions are smaller and quicker. That, in turn, means more concurrency and throughput.